I think I owe everyone an apology for being so remiss in blogging... things have been really overwhelming this year and if I haven't been posting as often, it's because I'm up to my neck. I would list a few of the things that have kept me so buried, but I think then I'd be too exhausted to write about my new cuff and tutorial. I looooove freeform beadwork. Not just making it, but looking at it, seeing what other artists have done with it, and feeling it in my hands. Freeform is just so playful, and inherently unconscious, and ...well...freeing. I love the No Rules approach, and the fact that you canNOT make mistakes... there aren't any! I've been playing with it for ages (and it does feel like playing - no work here!) and experimenting with combining it with other stitches and techniques; this is where Reflections and Mistress were born. I started out this time with a huge pile of bead soup that I threw together when I was feeling uninspired. I wanted to just mix up some beads to see if it could lift me out of my funk, and it did. Once I had mixed them happily in a pile, I found that I had stashed away some lovely focal bits that would go with it... and Atlantis happened. As I began my first row of freeform peyote, it occurred to me that I hadn't seen a tutorial in awhile about freeform, or freeform combined with other techniques, and that it would be fun to make one geared toward helping others find their own joy in freeform while also showing how I did my thing. Last night, I finally finished the cuff, and the tutorial at the same time. It's a very different tutorial than my usual; it isn't step by step at all, but more of a guide on how to combine the different stitches, and how I went about making this one cuff in particular. It's more chatty than my usual professional tone, and I think that makes it more accessible. The premise is to inspire and to help someone make the combinations themselves in ways that please them, rather than simply making my cuff themselves. It starts out with a little basic freeform tutorial that combines peyote and right angle weave, proceeds through the cuff planning and process of embroidering focals, bezeling stones and weaving it all together, and then ends with a gallery of pieces I have made with notes on how I combined different things in their creation. If you're interested in it, you can find a copy of it here in my Etsy shop, and a few of my favorite freeform artists (Cynthia Newcomer Daniel, Linda Roberts and Laura Zeiner) have given some tips in there, too - which I am very grateful for. both of which were created using the same techniques as those I outlined in the tutorial. Happy beading, everyone - and peace during this seasonal rush, too. Wonderful! Thanks for the shout-out. Again, I think this tutorial will sell like gangbusters! Very excited by this opportunity to bead a la Nancy! Can't wait to begin choosing focals and souping it up. I have managed to get a few people over to freeform, but I can see this tutorial opening the doors to even more 'Freeform Fearful' beaders, and liberating them! Absolutely awesome Nancy! I hope your pattern inspires many beaders to give freeform a try. Your work is beautiful! Awesomely beautiful. And the tutorial sounds just perfect. I miss your more frequent blog posts but I'm always happy when one pops up, no matter HOW long it's been. We all have our own rhythms and they change from time to time. I'll gladly embrace whatever rhythm finds you able to bead, and post! I really love the way you do freeform beading. It's different from most, and I think prettier too. Your sense of color is wonderful. Thank you for sharing your work with us. Hallo! Your beadworks are super-beautiful! 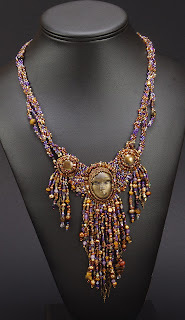 I have purchase your tutorial "Justine" and I realized this necklace and I published in my blog http://meraviglioseperline.blogspot.it/. Maybe do you want to see? Thank you and sorry for my terible english! Nancy, your cuff is gorgeous, and I'm so excited about your tutorial because I love, love, love freeform! 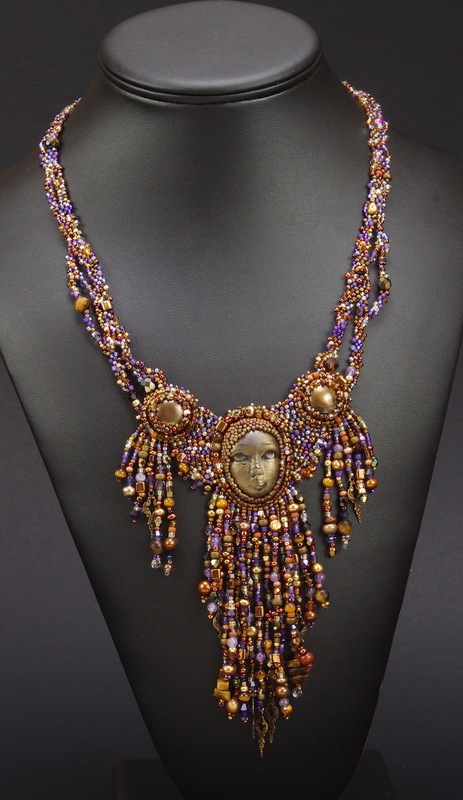 I have Karen Williams' book and love it to pieces, and I love combining bead embroidery and freeform. I hear you on being overwhelmed. That's why I haven't been doing as much social media stuff this month and may even take a break from blogging next weekend. I hope things calm down for you after the holidays are finished! I'll be in Vermont on the 23rd and 24th of this month... are there any bead stores in your neck of the woods that I shouldn't miss out on? PS: Please, tell me you're entering Reflections in Bead Dreams this year. I can clearly picture it on display in Milwaukee!